Halloween is around the corner, which means lots of costumes, candies, parties and the occasional scare. No matter if you’re hosting a Halloween Party, or just want to give some of your daily snacks a different presentation, we offer your 3 awesome and easy ideas for your food. 1. Cubos de hielo con gusanos de gomitas: no tiene ninguna ciencia. Coloca gusanos de gomitas en una charola para hielo y llénala con agua con colorante. Congela y listo! 1. 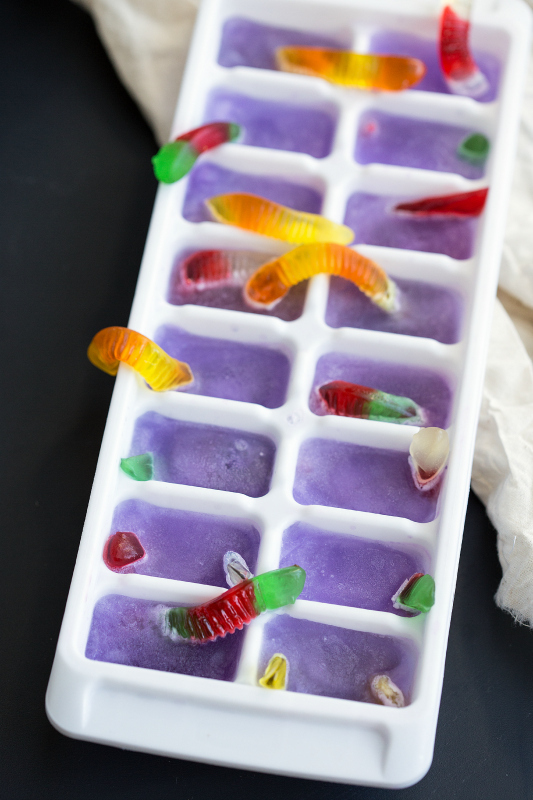 Gummy worms Ice Cubes: Simply fill an ice-cube tray with some gummy worms and pour in your colored water. Stick them in the freezer til frozen solid, and you’re good to go. Primero pega la parte de atrás de los dientes de vampiro para que permanezcan cerrados. Es muy importante este paso!! Coloca los dientes de vampiro al centro de la dona y los ojos de gomitas o chispas de chocolate y LISTO! 2. Monster donuts: you just need some donuts, vampire teeth and candy eyeballs (or chocolate chips). Use hot glue to glue the vampire teeth together in the back. Put the teeth and eyeballs and you’re done!! 3. 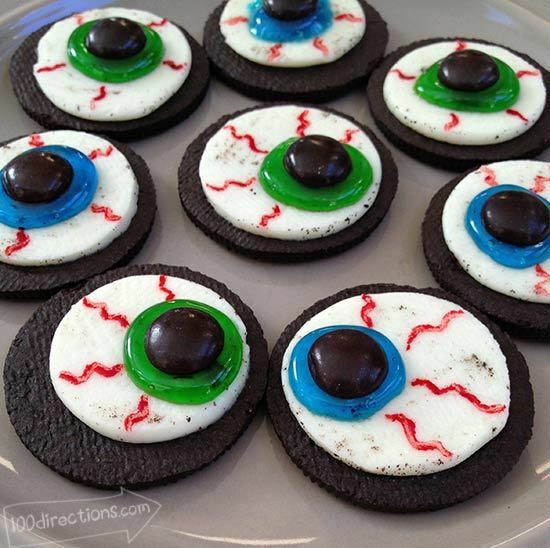 Ojos de Oreo’s: necesitas oreo’s, betún en gel azul y verde, colorante rojo y m&m cafés. Separa la galleta a la mitad con mucho cuidado. Coloca un poco de betún y después un m&m para hacer los ojos. Por último, con un pincel muy delgado, pinta líneas chuecas para que parezcan venas. 3. 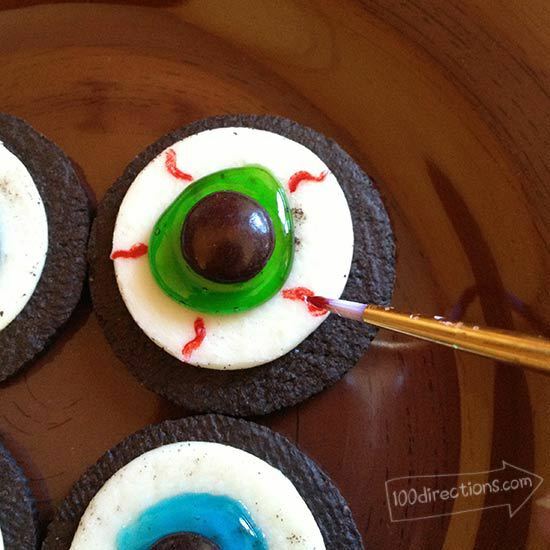 Oreo’s eyeballs: you need some oreo cookies, gel icing, red food coloring and brown m&m’s. Put a small amount of icing and then the m&m to make the eye. With a small paintbrush, draw some lines to create the veins. This entry was posted in Recipes and tagged diy, food, halloween, inspiration, parties by bazarikamx. Bookmark the permalink.